With the publicity of Matt Farah recently driving Kenn Kite's ATS built 450whp MR2 we decided to put the recipe up there for people who want this build. The availability of E85 has made 450whp the sweet spot of bang for the buck MR2 performance. For example 450whp can happily run our $300 1200cc injectors instead of $900+ ID2000's. 450whp is also the limit of the side mount intercooler, and stock intake manifold. 450whp is also the limit for a single disk clutch, so you get a $500 Stage 4 instead of a $1400 twin disk. And finally 450whp is the practical limit for the 3S block, beyond this number we suggest upgrading to the 5S block. This E85 build will make about 330-350whp on pump gas. If you are trying to make 450whp on pump gas, well bad news.....it's going to cost a lot more because you need to do considerable flow modifications due to the limits of 93 octane. By the way I am assuming we are doing the installation here, so no need for a core deposit. Get the Gen2 S1 cams. I don't care if you have a Gen3, Gen4, Gen5, The GEN2 S1 cams are the ones you want. They spool faster and make the same peak power at this level. The price of cams is changing soon because GSC is going to billet blanks, but this head with cams and cam gears should be $1700 total. That will get you a set of ARP head studs, ATS metal head gasket and a low temp thermostat. I don't have a water pump on the website yet, but they are $125 for genuine Toyota. I have found the aftermarket ones come as only the front half and they tend to leak. On to the turbo kit: ATS Racing Garrett GT3071R. This thing spools very close to stock and will make just over 500whp if pushed. The ATS Top Mount Intercooler kit also includes a 3” intake that deletes the factory AFM. This intercooler is the best air/air solution available without cutting your trunk or going to a heavier and more expensive water to air intercooler package. Get the optional Tial BOV, because it sounds cool. We need to add about $100 for fluids like VR1 race oil, oil filter, coolant, clutch fluid. 450whp is approximately 570 flywheel horsepower. Flip through the latest Car and Driver and find the list of 570hp new cars. It's pretty short. Now look and see how many of them are under 3000 pounds. 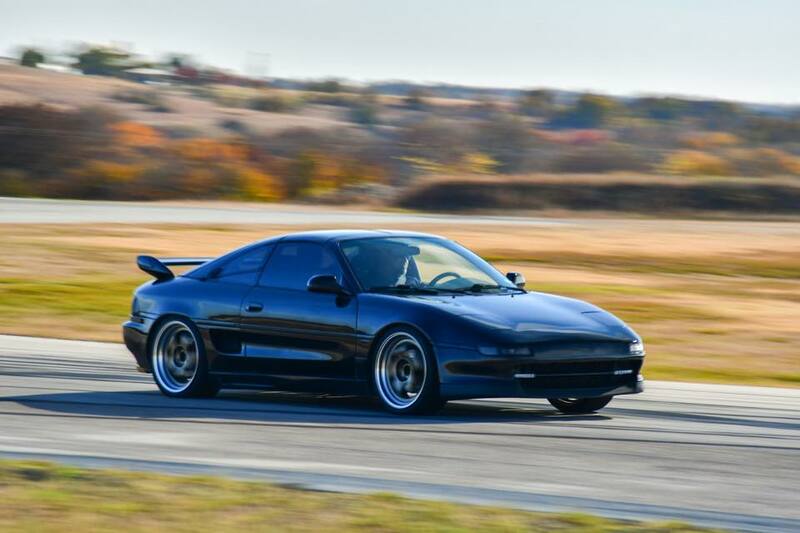 570 horsepower/3000 pounds puts the MR2 in an incredible power to weight class. At this power level the car is capable of 10 second quarter mile times on drag radials, but still has the drivability and reliability of the stock car. The one pictured above was build by ATS in 2009 and is still going strong today. ATS throttle body inlet - 91-92 only, the 93+ already has an ample sized inlet. ATS Side Mount Intercooler with fan and shroud kit - I would prefer to use the top mount, but I don't think I can squeeze the stock AFM in there. Hopefully I can update that soon. APexi AVC-R electronic boost controller. As far as I know this is the only boost controller that offers boost versus rpm control. Under normal conditions we limit all of our pump gas builds to 17 psi, but there is a small loophole we can exploit. The knock limit of the 3SGTE is basically defined by the torque curve. Most of these cars hit peak torque about 5000 rpm. We use the rpm dependent boost controller to raise boost a couple pounds after 5000rpm to keep torque from falling off. This in turn raises the high rpm horsepower substantially. Total parts cost is about $7000. I have done this recipe many times over the years. The worst I have seen from this is 330whp and the best I have seen is 360whp. Now, if I had a little bit more in the budget the first thing I would change is the rom tuned ECU, I would swap that for a EMU and the next thing I would change is the fuel system, I would run a top feed rail and 1200cc top feed injectors. By switching to these items you open youself up to the possibility of E85 and lots more horsepower in the future. Additional thoughts: The cost of a new AVC-R and a rom tune is actually higher than a EMU with the rpm dependant boost control option. The catch is the EMU will require some tuning, but I think the cost difference even after tuning would be about $400 higher for the EMU. NEW Clutch Pedal Rebuild kits and OEM Clutch Master Cylinders available in the Drivetrain/Clutches section under parts. The new tech at ATS is also a great videographer: https://www.youtube.com/watch?v=QvVQotvAMq8 John came out from Lubbock, TX to have us tune his car in 2014. Luckily he brought along a collection of cameras. We had such a good time and were so pleased with the results (both of the car and the video) that John joined ATS Racing as a full time technician in January 2015. John did an amazing job making ATS look more like a professional shop and less like a junk yard (no easy feat, notice he has to point the camera at the ceiling a bunch, haha). His reactions to riding in his own car after our tuning, and to riding in my car at ~750whp are priceless. The rest of us at ATS are anxious to see what John comes up with for our next video project. Thanks and stay tuned. Check out our new COOL TOOLS section under Engine parts. We plan to load it with some of our favorite specialty tools. ATS Racing is proud to now be using My Shop Assist http://www.myshopassist.com/ For scheduling and tracking current projects. It allows us to keep our customers up to date on their projects, and gives us a much better idea of scheduling both for customers and technicians. The ATS Racing phone system is currently being repaired. If you have urgent requests or questions please feel free to e-mail us at sales@atsracing.net. If you need Aaron or Scott specifically, please e-mail either atsaaron@atsracing.net, or scott@atsracing.net. Sorry for the inconvenience. Who says you can't drift an MR2? Hugo Soto, one of customers from Spain just sent this video to us... Hugo Drifting MR2 Hugo is running an ATS 2.2L Stroker, ATS GT3071 turbo kit, Apexi Power FC ECU. Shipping Estimate now available in Shopping Cart. ATS Top Mount Turbo Manifolds in Stock! Air Filters and Intakes added to the Parts page. Choose 3.5 or 4" intakes for your MR2. Phones at ATS Racing are working again. ATS Racing Intake Manifold makes over 700RWHP! Greddy style intercooler shroud and 9" fan available now! ATS Turbo + ECU + Fuel Combo kits now available. Save big!